At Kersbrook Equestrian Centre our aim is to provide our clients with constructive training opportunities in a safe and professional environment. We can help you start your young horse, solve problem behaviours, as well as developing your riding and competition skills; we also provide extended training opportunities with seminars and riding clinics. The facilities are ideal for clinics, small shows and educational activities. Our all-inclusive agistment offers outstanding care in safe paddocks where horses live in the most natural state possible. Agisters have full access to all facilities as well as the riding trails of the Kersbrook Forest and enjoy discounted fees for lessons. Principal trainer, Nicki Stuart, brings diverse skills, detailed knowledge and empathy to every session. She is both qualified and experienced. Nicki is dedicated to positive communication, developing effective rider posture, and ensuring the welfare of the ridden horse. 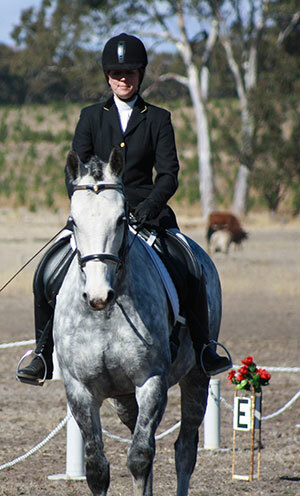 She has helped hundreds of riders enhance their communication and improve their skills, both on and off the horse and has contributed to South Australia's wider horse community through voluntary work. You can view her full equestrian resume here. Away from horses, Nicki had a twenty-year career as reporter and producer in radio and television with the ABC. She has trained horses and riders in India and the UK and is on the board of the Human-Elephant Learning Programs (www.h-elp.org) which delivers ethical training to the handlers of captive Asian Elephants.